The best ways to deliver mobile tickets and reservations. Mobile reservation and ticketing system tie-ins for movies, restaurants, hotels and more. Mobile reservations and tickets can be triggered from a 2D barcode or from a link in a mobile landing page. Both options are direct to content. 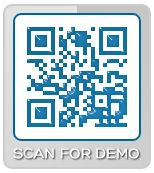 Scan the code to demo mobile tickets and reservations. Social Media, Email, Radio Tie-ins.